Have you seen black Sigatoka symptoms? If you see black Sigatoka symptoms, report them to Biosecurity Queensland immediately. Do not touch the lesions or move plant material off your property - this can spread the disease. 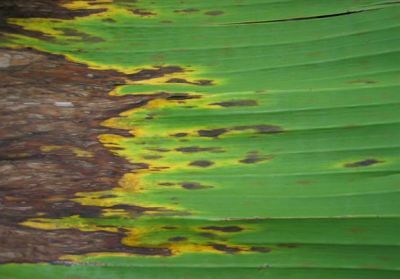 Black Sigatoka (sometimes referred to as black leaf streak) is a fungal leaf spot disease of banana caused by the organism Mycosphaerella fijiensis. 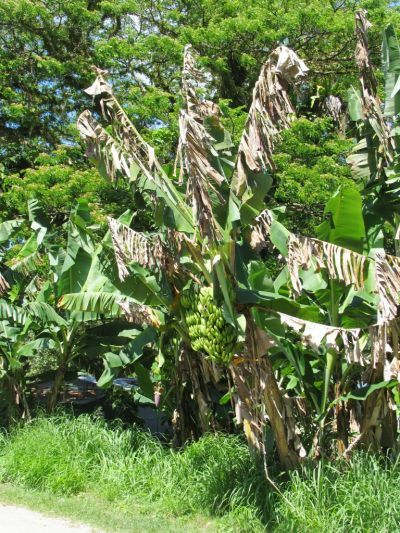 Not present in mainland Australia, black Sigatoka is one of the most devastating leaf diseases of banana in many countries around the world. Severely infected leaves can die, significantly reducing fruit yield, and causing mixed and premature ripening of bunches. Leaf symptoms of black Sigatoka are very similar to those produced by yellow Sigatoka (caused by Mycosphaerella musicola), a closely related fungus that is present in Australia. 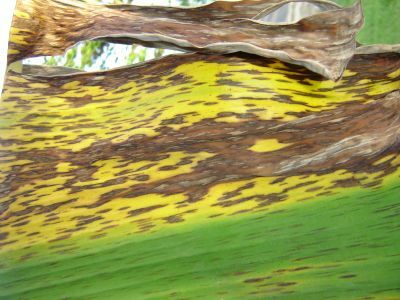 Eumusae leaf spot (caused by Mycosphaerella eumusae) symptoms are also very similar to those caused by both black and yellow Sigatoka. Eumusae leaf spot is not known to be present in Australia. Black Sigatoka leaf spots begin as small reddish-brown flecks (1mm) on the lower leaf surface. These gradually increase in size to form dark linear streaks (4-12mm) parallel to the leaf veins that are visible on both leaf surfaces. The streaks expand becoming elliptical spots often with a distinctive yellow halo. As the lesions mature further, they become sunken and the centre turns grey. In susceptible cultivars, high levels of disease can cause large areas of the leaf surface to die. Narrow streaks run parallel to the leaf veins. Early lesions are reddish-rusty brown and most evident on the underside of leaves. As they develop, lesions become dark brown to black, with lesion centres eventually turning grey and becoming sunken. Heavy infection levels cause large areas of leaf to turn necrotic, which can lead to total leaf collapse. Heavily infected leaves die, reducing fruit yield and causing uneven ripening. Black Sigatoka symptoms can be difficult to distinguish from yellow Sigatoka (caused by Mycosphaerella musicola). 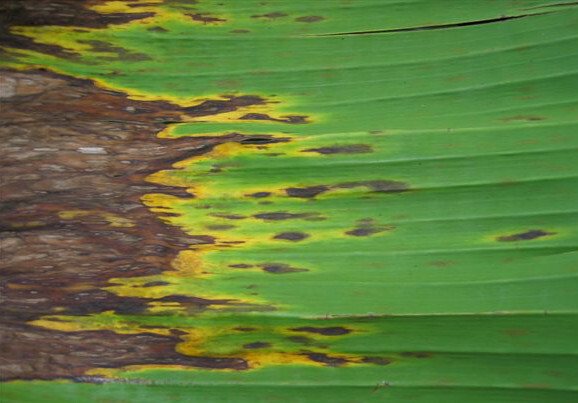 With black Sigatoka, early leaf streaks are reddish to rusty-brown, longer and broader than yellow Sigatoka and most evident on the lower leaf surface. 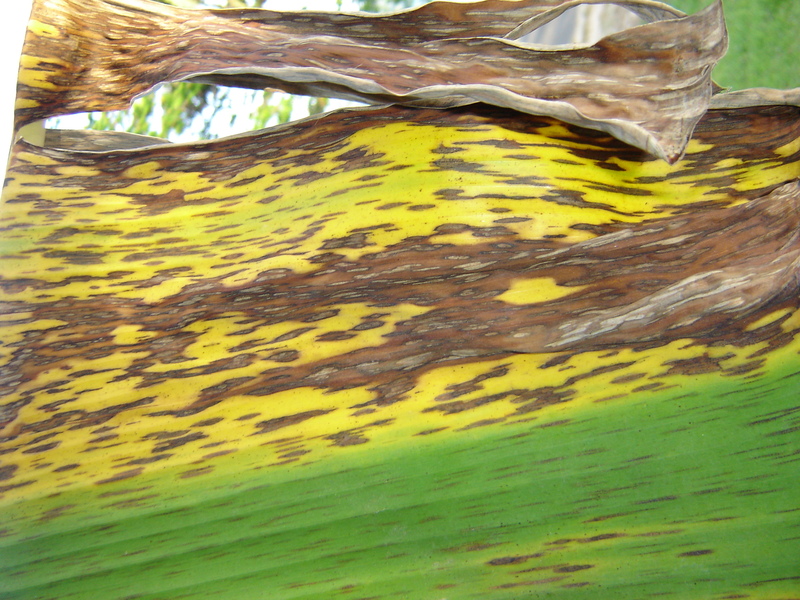 In comparison, early streaks of yellow Sigatoka are yellow-green, narrower and shorter, and more prominent on the upper leaf surface. Both diseases can be present on the one plant. Black Sigatoka can also be confused with eumusae leaf spot (caused by Mycosphaerella eumusae). Laboratory testing is required to reliably distinguish these diseases. Infection is favoured by hot, wet and windy weather. 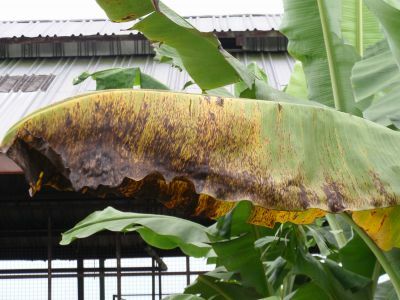 The disease can be spread by the movement of infected plant material, or by fungal spores produced on leaf lesions or within dead leaf material on the plant, or in the form of trash. Black Sigatoka spores can be dispersed by the wind or by water splash. The unfurling and youngest fully expanded leaves on large plants and suckers are the most susceptible to infection. As the leaves mature, they become resistant to infection. There is also evidence to suggest that the disease can be spread to other areas by contaminated fruit shipments. Black Sigatoka is present in all major banana exporting countries. The disease is widespread in South East Asia, India, China, the southern Pacific islands, East and West Africa, USA (Hawaii), Grenada (Caribbean), Trinidad, Central and South America. It also occurs in Papua New Guinea and on several islands in the Torres Strait. There have been several outbreaks of black Sigatoka on the Cape York Peninsula in Queensland (i.e. Bamaga, Pascoe River, Bloomfield River, Weipa and Daintree) throughout the 1980s and 90s. The only outbreak in an Australian commercial production area occurred in Tully, North Queensland in 2001 - the successful eradication of the disease was a world first. Reinstatement of mainland Australia's disease-free status for black Sigatoka occurred in 2005.